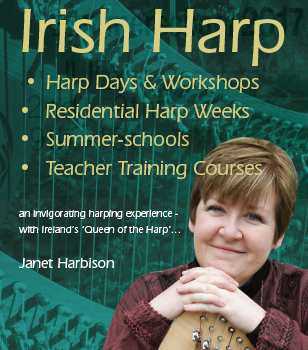 www.janetharbisonharp.com - the new home for the Irish Harp Centre! 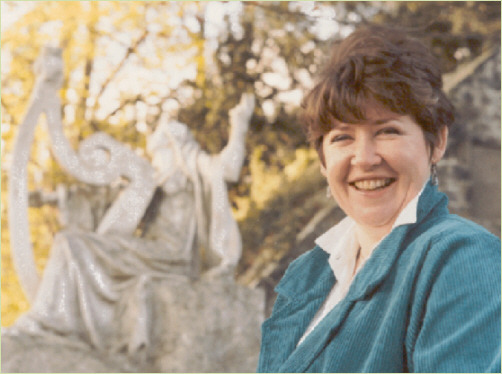 Janet Harbison established the Irish Harp Centre in Co. Limerick, as a place of learning and a base for Irish Harping. She has now developed that work to become an international online centre for the Irish Harp. Containing a wealth of information and artices, and a growing collection of downloadable sheet music, CD's, individual downloadable tracks and Janet's Tutor Books. Janet now shares her extensive knowledge with individuals and groups in workshops, masterclasses and residential courses in Ireland and also in Europe, America and in 2018, the far east (Japan). Janet continues with her performing and teaching activities around the world. She was recently appointed the Visiting Professor of (Irish) Music at the University of Ulster (Derry). She is also currently developing an online Irish Harp College. Oratorio for Soprano, Chorus and Harp Orchestra; (80 mins) narrative follows the life and times of the 6th century Irish saint, including some of St.Colmcille’s own poetry. Also arranged with visual projections. (Published on BHO CD: Colmcille). Suite for Soprano, Alto and Baritone solos, full chorus and harp orchestra (70 mins). 12 old Irish Christmas songs (including 2 Wexford Carols) and 3 original songs in Irish, English and Latin (some Macoronic). Available on commercial video. (15 mins) for multiple harps (min.8 parts) with solos: lambeg drum, fife, fiddle. Music includes themes of ‘The Boyne Water’ and ‘The Foggy Dew’ and presents the ‘story of the troubles’ in music (optimistically!). (12 mins) Based on the poem by Maire Mhac an tSaoi, for unaccompanied SSA choir, won Oireachtas prize for new works for choirs, 1983. (11 mins) Composition for multiple harps (min.8 parts) celebrating the celtic spirits of nature’s elements. (7 mins) for multiple harps (min.3 parts) composed for reopening of Magee College, Derry. Also arranged for harp solo. (6 mins) Composition for multiple harps (min 2 parts) also arranged as harp solo. Won the Awen Trophy, Festival Internationale de la Harpe Celtique 1985 (on BHO 002, O’Neill’s Harper) Published Coup Briez, France. (4 mins) Composition dedicated to Janet’s mother, harp solo (on BHO 002, O’Neill’s Harper). (4 mins) Dedicated to Prof. Basil Wilson (RIP) (on BHO 006, The Wedding Album). (4 mins) Lullaby for the comforting of Janet’s brother and his wife on the death of their son Daniel. For multiple harps (min 2 parts) also harp solo (on BHO 007, Colmcille with BHO and BHO 008, Prayer). (4 mins) Composed when homesick on tour in the US (on Polygram, Harpestry).